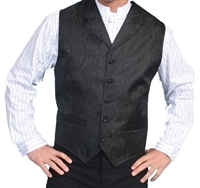 Classic paisley vest with notched lapels. Covered buttons and two welt pockets for your watch and chain. Adjustable back strap. Available in Black, Brown, Burgundy, Gray, Purple, Teal, Dark Tan. Elegant paisley vest with shawl collar. Self covered buttons, two welt pockets, and an adjustable back strap. Available in Gray and Red.